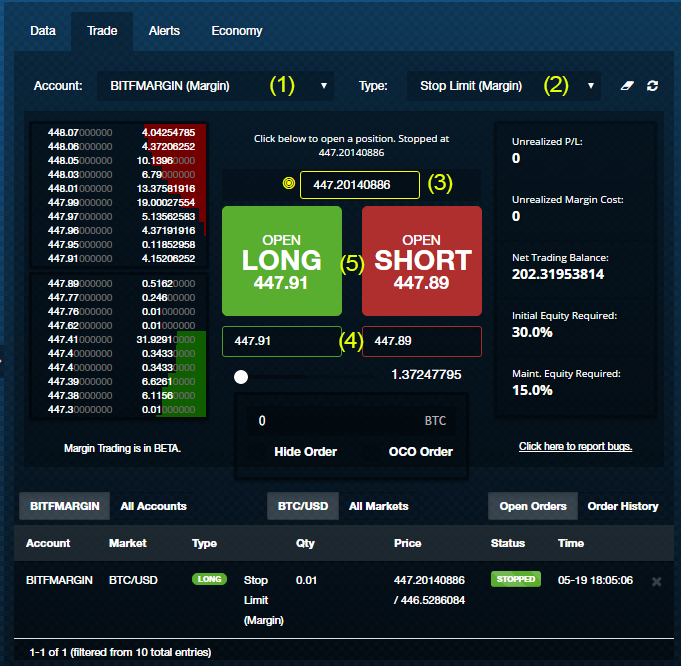 Happy to announce a new feature for margin traders: the Stop Limit (Margin) order type. This feature works in exactly the same way as our standard exchange Stop Limit orders. When the target (stop) price is hit, the order will be placed on the exchange. Stop Limit orders are placed internally within Coinigy and remain completely off of the exchange’s orderbooks. Once the target (stop) price is triggered, only then will a limit/margin order be placed. To use this feature, select your margin account (1), then choose Stop Limit (Margin) (2), enter your Stop Price in the yellow box (3), and choose your target long or short price (4), then place your order (5). If you have any questions, per usual please find us in Support Chat or put in a ticket.